Organization of your workplace is the key to improving the quality of what you do as a quilter. With this in mind, I crafted this "Store 'N Find" for you to increase your workplace efficiency. 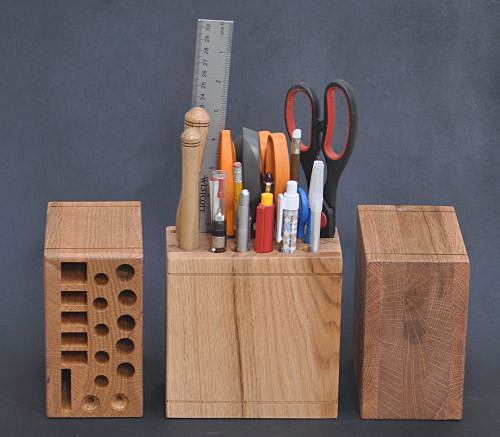 The "Store 'N Find" is an innovative, handsome wooden case made by Fred's Creative Woodworking for storing your much-needed sewing tools in plain sight on your work area. Now, when you are done with that pair of scissors or the thread pic, simply return it to this beautifully-crafted case where they can be easily "rediscovered" with no aggravating "hunt and find"! The "Store 'N Find" is approximately 5" wide, 3" deep and 4" high. They vary a bit from these dimensions. If this is critical to you, please e-mail me and I can give you exact dimensions for the one in which you are interested. 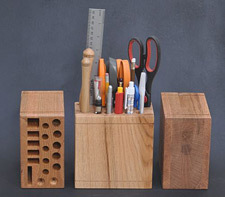 The "Store 'N Find" can hold 6 pairs of scissors and 12 round items, such as marking pens, pencils, seam rippers, thread pics, etc. It also has a slot to hold rulers. The "Store 'N Find" is made from hardwood and is well-balanced and heavy enough that it won't easily tip. Note from the photos that the bottom is solid so that any items placed into its slots will not scratch a work surface upon which the case sits. The photo at the right depicts one of the ways in which I organize the holes in the unit. Most now have the several round holes and two long holes on the left. I've found that this configuration works best for all of the various doodads that quilters use. If the configuration of holes is an issue, let me know and I can make one with your needs in mind. The "Store 'N Find" is made from your choice of either Cherry or Oak. They sell for $55 each plus $5 shipping.